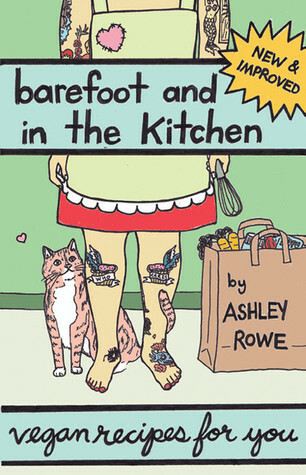 I first picked up a issue of the zine Barefoot and In the Kitchen in SF. I was specifically looking for vegan zines and this one stood out! The art was cute and the recipes were tasty looking. Fast forward a 5+ years later Ashley Rowe has turned her zines into a book! 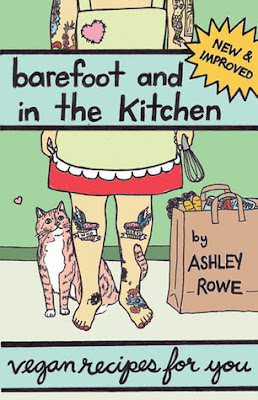 The book has a cool cover (cat + tattoos = rockin'! 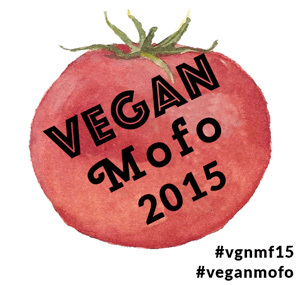 ), tons of cute art and lots of yummy vegan recipes that are do-able! I have bought a copy to give away to one lucky reader! To enter please leave a comment below telling me what your favorite type of zines to read are. I will pick one random winner on July 31 - please leave a way for me to contact you in your comment. The contest is open to everyone. Good luck! Congrats Space.Clown - you are the winner! Cool! My favorite zines are vegan ones, of course.... I wanna get the your new Vegan Spa Day zine so bad- I'll probably cave on Friday/payday! My favorite zines are by default full of yummy vegan recipes, but I also love cute illustrations and a fresh, fun writing style. I love per-zines with a thematic focus! And, of course, any DIY zines (vegan cooking included!). Thanks for offering the contest!